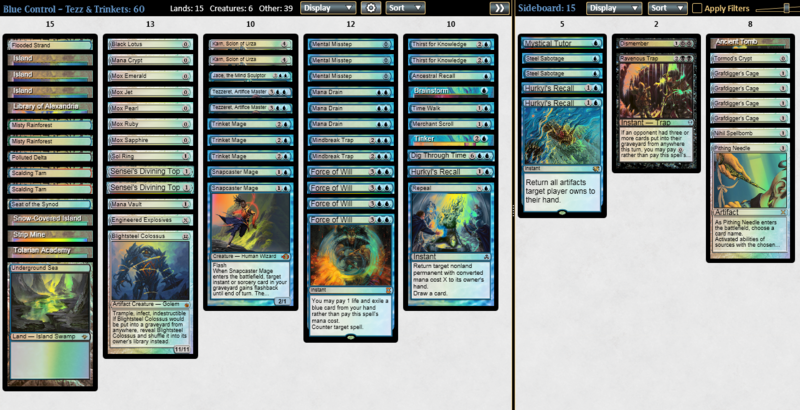 @chubbyrain Was 3-0 (2 x PO and DPS) when MTGO did MTGO things and I wasn't able to join another match. Karn and Tezz have both been very good in my limited experience. I've had Tezz in play 3 times I think and always with 3 artifacts. @chubbyrain based on what you were doing I threw something together with Sai and Tezz and it made me realize Skullclamp is actually good with Tezz as well. Maindeck energy flux, more viable than ever. Yeah, the fact I'm running E.F. main is the only thing keeping me from trying out Tezz 3.0 in my current build.